How could I not cosplay Sakura? Cardcaptors was my favourite show as a kid and I used to run around my house with an old broom handle which I pretended was her staff, a grey pleated skirt and a matching grey hat which I pretended was her school outfit. There are just so many costumes to choose from so I decided to go with a costume from one of my favourite episodes of the anime... just to start (because of course I plan to make more CCS cosplays). I ended up choosing her outfit from the shadow card episode! Leotard - The leotard was made using a four way stretch, blue lycra, with more stretch across the grain. I used the Green Pepper "Crystal Lake" Skating Pattern with sleeves as a base, modifed the neckline to be a mandarin collar and added an invisiblie zipper along the back seam. I didn't reinforce the collar as I wanted to keep the stretch in the material. Waistcoat - Since the waistcoat had gold piping along princess seams and incorporated a tail coat, I decided to take one of my princess dress patterns and modified it heavily to give me the pattern for the waist coat. Originally I was going to finish the seams with french seams but soon determined that a lining would give the fabric better stability (I used cheap poplin) and a better look overall (no blue colour showing through the white waistcoat). The gold piping was made using gold bias tape and a thick cord as the base while the trim all along the bottom edged was just bias tape. The waistcoat opens in front via two long strips of velcro. I hand sewed the velcro to the lining. Cape - The cape is a 3/4 circle cloak but since I had a budget to look out for I opted for a half circle cloak. It also has two mandarin collars which was a puzzle to figure out. 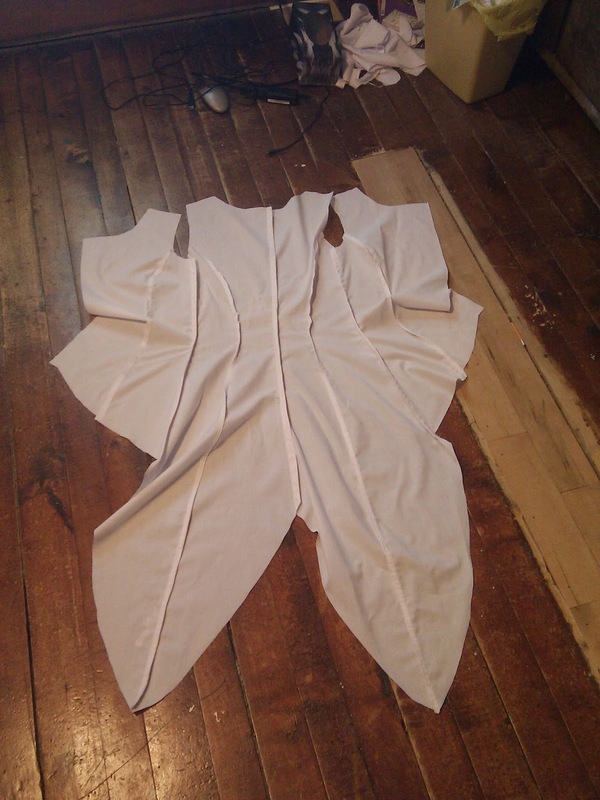 The pattern for the cape was made using a half circle for the main body folded in half. The petals were drawn on the quarter circle and cut out so that both sides matched up. The neckline was made large on the main cape. The neckline was reinforced with a piece of red fabric that had a smaller neckline, thus solving the two collar situation. The length of each neckline was measured and the mandarin collars were made based on each measurement. Sewing the collars together was rather tricky but I managed to work in out in the end. The hem for the cape is a simple rolled hem. The bow was made separate from the cape. It is attached by passing a fabric band through the bow knot. The cape is removed by opening the band (yay for velcro). Gloves - Like all my other gloves, I made these from a pattern that I drafted myself, modifying it to match with the stretch of the fabric. 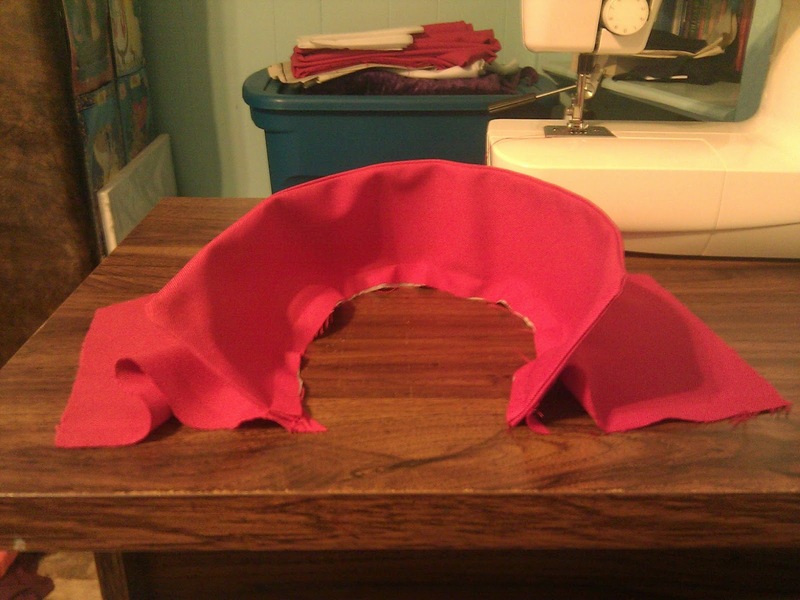 I used a rather weird spandex/lycra material as the ribs in the fabric feel stiff when stretched out. I had to hand sew all the fingers and even fix up some holes that popped up the entire first day I wore them :S The cuffs were stuffed with spare ponti di roma fabric I had lying around. The ponti di roma was layered and sewn together to give it the nice smooth look all around the cuff. As the inserts aren't fixed to the outer fabric they tend to move around a lot when washed which means that I have to adjust them all the time. Hat - This was my first time making a hat! I found a beret pattern online and used that as the base for the hat. I exagerated the proportions to make the hat seem bigger than my head. The long dangling pieces were made using leftover blue lycra and gold painted craftfoam for the pendants on the ends. They were sewn into the hat band. The hatband turned out to be too small for my head plus the wig so it has to be pinned in with barrettes. Wig - I had bought a wig off of cosplay.com thinking that it was the prefect colour for Sakura. It turned out to be too blond. Originally I was going to work with it but as the deadline came closer I decided that I would attempt to dye it a darker shade to match the character better. I tried so many ways of dyeing it and the only way it would take colour was by putting four brown sharpies in a spray bottle with rubbing alcohol. I now know that I should use a ton of sharpies to dye a wig using the method I was using. 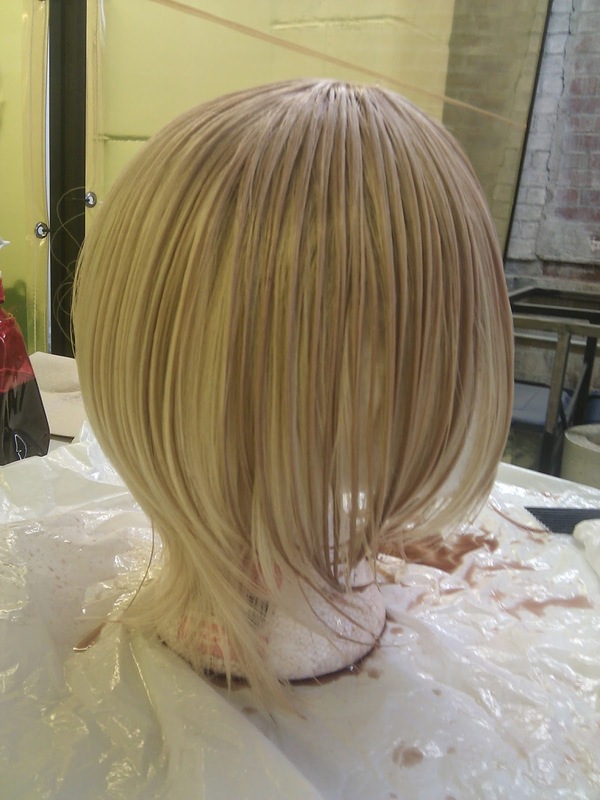 Next time I might try and just soak the wig in the solution instead of spraying it on. 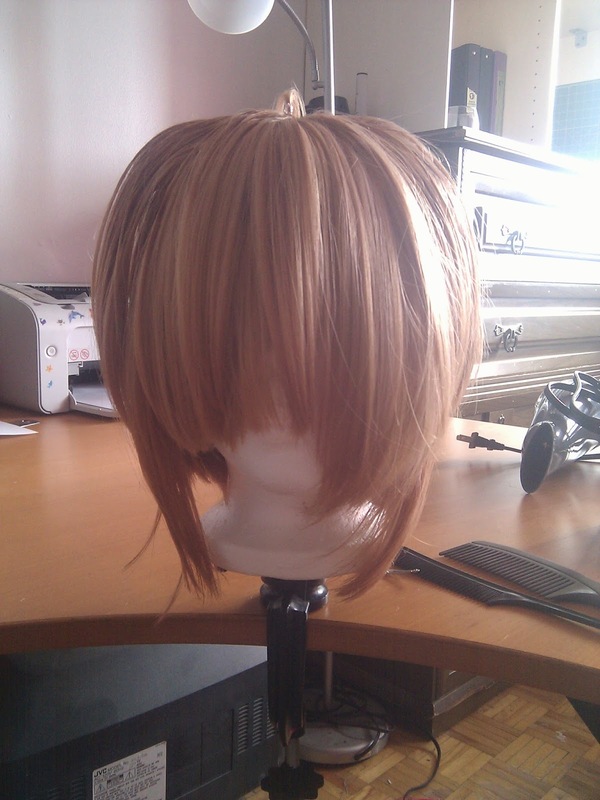 Once it dried completely I cut and styled the wig. I teased the hair and combed untouched wefts over the bangs to make them fluffy. To get them to stay up I coated them in got2b glued hairspray, which is the best hairspray I have ever come across! To get the antennas I took some hair at the top of the wig and used a small clear elastic to make a tiny ponytail. I separated in into two parts and sprayed them until they stayed in place. Socks - I cheated and made legwarmers instead of having to deal with the whole foot thing. I used three measurements in total, the length of the leg warmer, my ankle measurement and my thigh measurement. I made two tubes and added elastic to both the top and bottom hems. The elastic doesn't keep them from falling through so I ended up having to use fashion tape to keep them up. Shoes - To get the same design that Sakura has on her shoes, I drew out the pattern and painted it with red acrylic paint. Unfortunately the red paint has started to come off on the rubber sole part of the shoe so that will need to be touched up again. Staff - The staff was the most time consuming part of the whole costume. 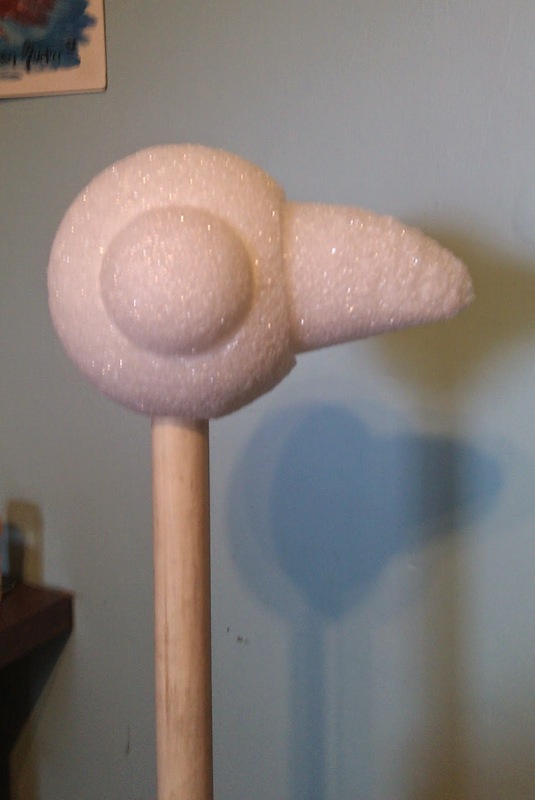 I used a one inch wooden dowel rob for the staff part and sculpted the head part out of a large foam ball, a smaller foam ball cut in two and a foam cone. The beak was fun to carve because I had to transfer a two dimensional shape to a three dimensional shape. It was very rewarding when I finally came up with the proper look! The foam acted as a base for the worbla. I heated the worbla in pieces and molded it to the head carfully as the foam started to melt as soon as I touched it! This made the final product lumpy and bumpy but I don't mind. It was my first time using worbla and my first large prop and I think it looks pretty good. Next time though I will use papier mache instead of a thermoplastic when foam is used as my base! 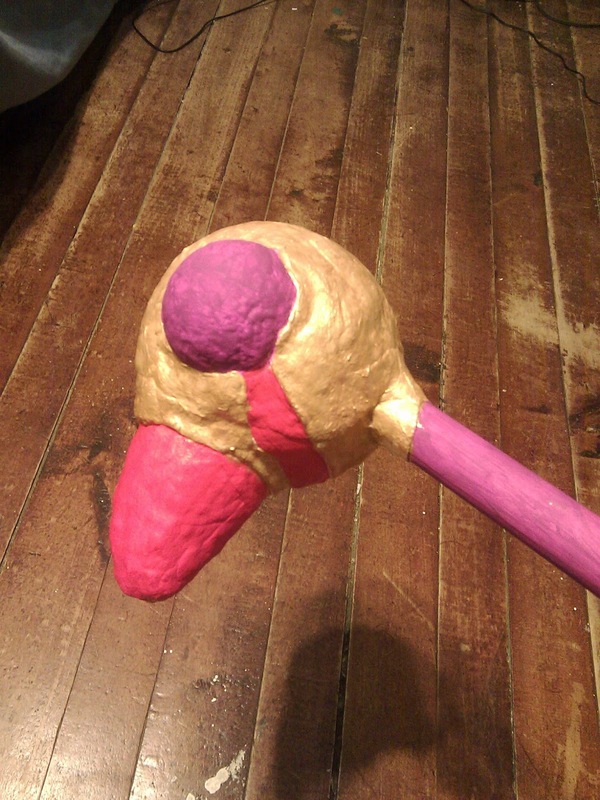 The bottom part of the staff was made by sculpting scrap pieces of worbla. 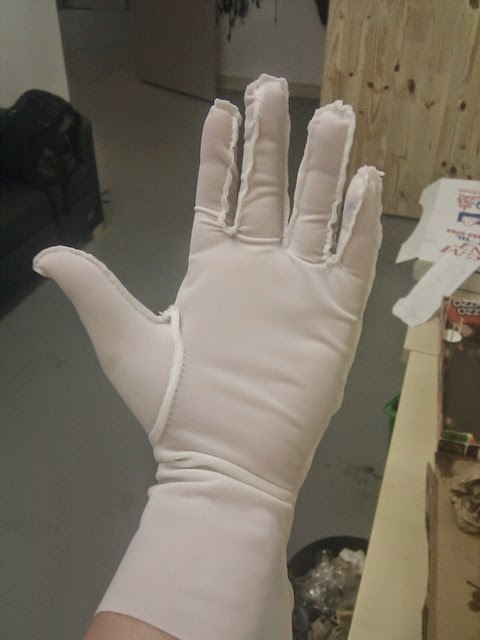 The worbla parts were then primed using a white glue. I painted five or six layers of the white glue and then painted two layers of gesso over that before giving it the actual paint job. The painting itself took some more layers depending on the colour used. Finally the whole thing had to be sprayed with a protective layer which I applied three times. The wings were made out of craftfoam and hot glued very carefully to the head to finish it up.